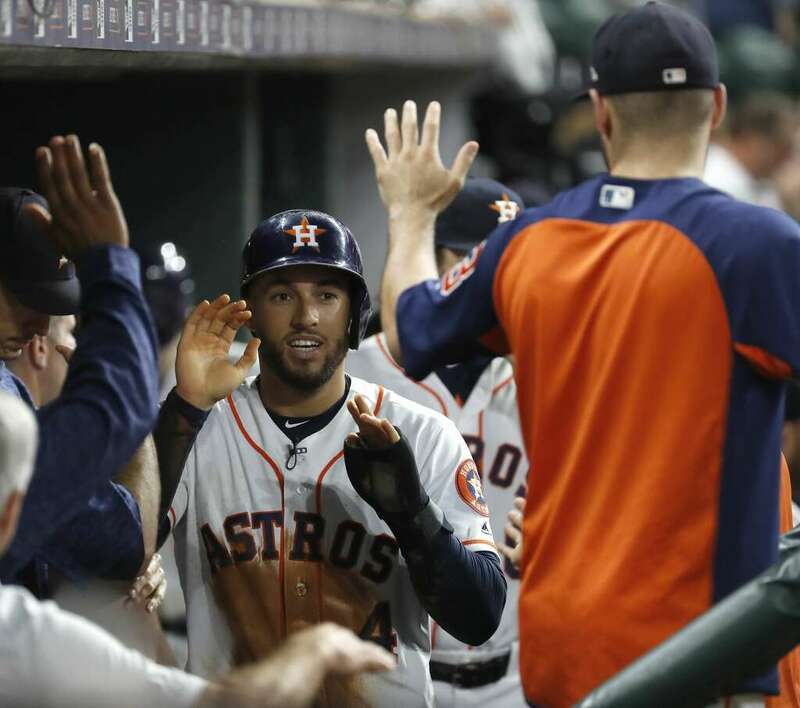 Before a national television audience on ESPN Sunday night, the Astros proved they are still Prime Time Players and it seems being in a national spotlight was what it took to switch George Springer's production back into the "On" position. The oft-injured outfielder went 3-for-5 Sunday, including a double and a homer as Houston took a 4-2 victory to split the weekend series with Anaheim. Gerrit Cole survived 5-2/3rd innings, allowing two runs on six hits and three walks while fanning nine. Joe Smith was needed to get him out of a sixth-inning jam then the trio of Ryan Pressly, Hector Rondon and Roberto Osuna closed out the last three frames without a major scare. Oakland had won earlier in the day so the lead remains 2-1/2 games in the A.L. West. Cole, meanwhile, with his 13th win, slipped into a three-way tie for most victories this season by a Houston pitcher. Charlie Morton and Justin Verlander also sit at thirteen wins. Keep in mind that the Astros won it all last year without a single 15-game winner. Shohei Ohtani was supposed to be the headliner, making his first pitching appearance since June 6th due to an elbow strain. The top-dollar Japanese import lasted just 2-1/3rd innings. Tony Kemp led off the third with a base on balls then Springer took a hanging curve and lined it into the Crawfords for a 2-0 lead. One out later, Ohtani was gone but not before setting a mark not done since Babe Ruth in 1919 - pitching 10 starts and hitting 10 or more homers in the same season. Cole ran into trouble in the fourth when a single, a hit batter and a passed ball eventually led to a run on a force out to cut Houston's advantage to 2-1. Houston got the run back in the fifth when Springer nearly homered again (he was credited with a double after review). A walk and a single followed then Carlos Correa drew a bases-loaded pass from Odrisamer Despaigne to retake the two-run edge. Cole and Tony Sipp filled the sacks in the sixth before Smith plunked David Fletcher to force home a run. Houston countered with Alex Bregamn's 27th home run, tops on the ballclub. That homer, off Junichi Tazawa, smacked off the limestone facade above the Crawfords to mark the final tally of the evening. There's no rest for the weary on Labor Day as the 83-53 Astros host the 63-73 Minnesota Twins in a 1:10 pm Central matinee. You can bet the Twinkies are butthurt about an 18-4 spanking by the lowly Rangers on Sunday. Dallas Keuchel (10-10) will hope to finally break the .500 barrier on his won-lost record as he faces righthander Kyle Gibson (7-11). The contest opens a three-game series that concludes the homestand. Minnesota took 2-of-3 from Houston at frigid Target Field back in early April. They've unloaded some of their top players since then, including Astro-killer Brian Dozier.